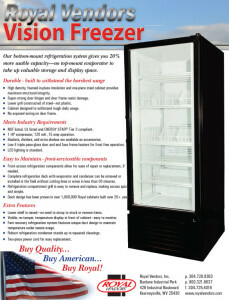 Vision Freezer — Royal Vendors, Inc.
High density, foamed-in-place insulation and one-piece cabinet provides maximum degree of structural integrity. Super-strong door hinges and door frame resist damage. Lower grill constructed of steel-not plastic. Cabinet designed to withstand rough daily usage. No exposed wiring on door frame. NSF listed, UL listed and ENERGY STAR® Tier 3 compliant. 1 HP compressor, 120 volt, 15 amp operation. Baskets, dividers, and extra shelves are available as accessories. Low-E triple pane glass door and face frame heaters for frost-free operation. Front-access refrigeration components allow for ease of repair or replacement, if needed. Complete refrigeration deck with evaporator and condenser can be removed or installed in the field without cutting lines or wires in less than 30 minutes. Refrigeration compartment grill is easy to remove and replace, making access quick and simple. Deck design has been proven in over 1,000,000 Royal cabinets built over 20+ years. Lower shelf is raised-no need to stoop to stock or remove items. Visible, no-tamper temperature display in front of cabinet-easy to monitor. Fast recovery refrigeration system features unique duct design to maintain temperature under severe usage. Robust refrigeration condenser stands up to repeated cleanings. Two-piece power cord for easy replacement.